The dark side and spotlight-chic combined. Made with our matte black vinyl and covered with our super-sparkly pale silver glitter. 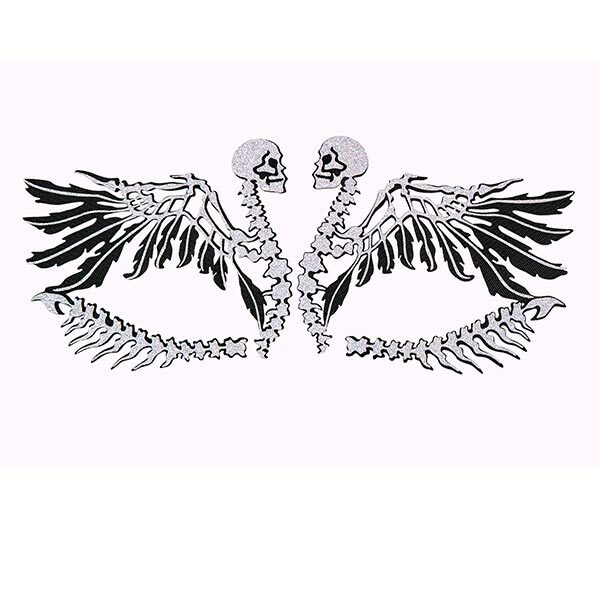 Part angel, part biker gang, totally cool. These designs are made with our matte black vinyl covered with our super sparkly pale silver glitter. The dark side and spotlight-chic combined. Pretty cubist futurism -now there’s a category! This design is super flattering and elegantly graphic. Combining the delicacy of florals with the gracefulness of wrought iron masterpieces from the second half of the 19th century, this design dramatically enhances the eyes. Made of five different layers of dazzle material set onto different backings to get vivid colourful variations of tones and shines. The elegance of a butterfly with the nightmarish skeleton of a bat: a “beauty and the beast” design. Wear it with the larger part of the design on the top or the bottom of the eye. Face Lace is proud to be a member and support the aims and objectives of the trade organisation ACID (Anti Copying in Design). 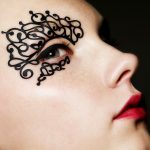 All Face Lace designs are supported by ACID through their Design Databank and ACID Marketplace.